After a few rough years at the International Island Classic, Steve Martin has finally had a bit of luck on his side at this weekend’s 26th running of the iconic event at Phillip Island. 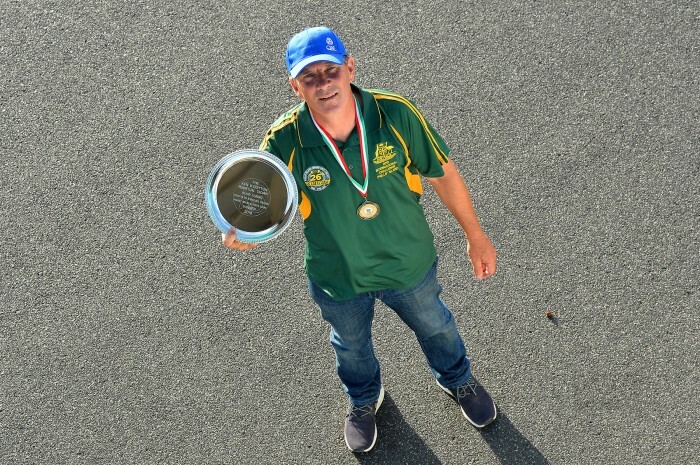 Martin, who is now a commentator in the Australian Superbike Championship, as well as a road tester for leading motorcycle media outlets in Australia told Bikesportnews.com this afternoon that to win the Ken Wootton Perpetual Trophy was ‘unbelievable’. “It’s pure elation. I can’t believe the result. For the Australian team and of course for everyone at Trevor Birrell Racing is fantastic,” said Martin, who did win the individual honours back in 2010 with a 1-1-1-1 result, but of course back then there was no trophy for the late great Ken Wootton, who unfortunately passed away in July 2011. It was race which marked Martin’s first race win since 2012. And what a race win it was. Martin beat his stable mate, Shawn Giles by a mere 0.142 seconds with Aaron Morris in third, 0.157 seconds behind. However, it was in the fourth and final race where Martin was locked in a three way battle with Alex Phillis and Jed Metcher, which made him feel young again on the bike. “I was starting to really get into it, which gave me a big buzz. To ride with the calibre of some of those riders on track is simply amazing,” said Martin who now has sixteen top threes from 38 race starts in the International Challenge. In the final race it seemed as if Phillis and Metcher had more pace down the straight, which meant Martin wasn’t going to slipstream the duo. With Martin scoring a 7-2-1-2 result, it handed the overall victory, and his first Ken Wootton Perpetual Trophy win.